Huyghe Adventures Abroad: Save The Japanese Children victim of the Tsunami fundraiser, Easter in Yunnan hiking, May in Mongolia discovering! 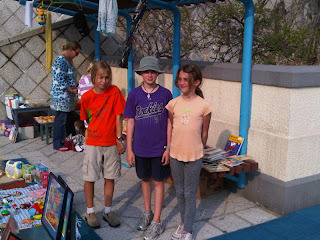 Save The Japanese Children victim of the Tsunami fundraiser, Easter in Yunnan hiking, May in Mongolia discovering! The adventures continue. After looking so much forward to our Japan trip for Audrey's 12th birthday, the unfortunate events of early March caused us to reconsider and adjust our vacation plans. Japan will be for next year, hopefully. 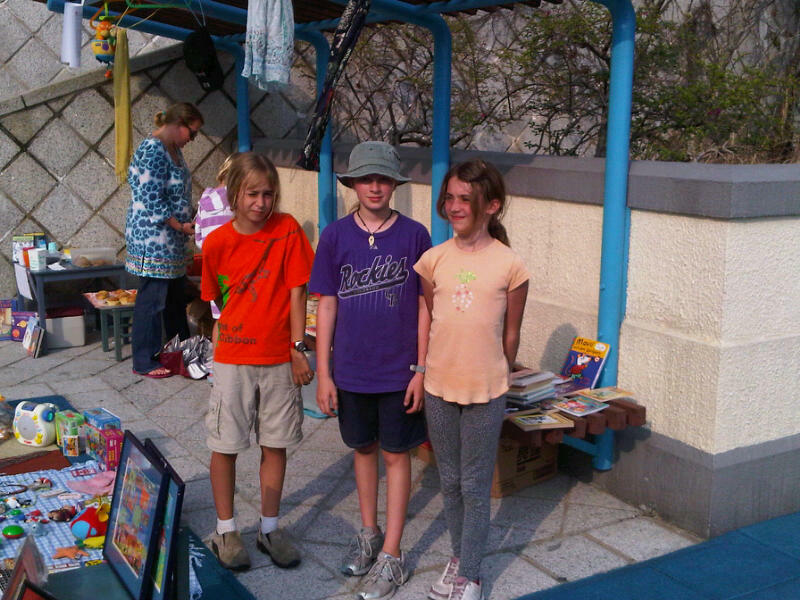 The kids were so touched by the plight of the Japanese people, they organized a huge neighborhood collection of toys, books and cakes/cookies and set up shop two consecutive Sundays on the residence playground. Their efforts resulted in raising over HK$8000 (over $1000USD!!!) 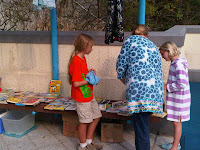 which we donated to Save The Children - Japan Tsunami Relief. We are so proud of them, their empathy and industriousness. This was a huge undertaking, collecting items for weeks and then dedicating two full weekends to sorting, fixing, tagging, and selling. They are great! We spent Easter Holidays in Yunnan Province, Southwest of Hong Kong. Yunnan, which means Clouds of the South, is bordering Vietnam, Laos, and Myanmar as well as Tibet to the northwest. It has the most concentration of ethnic groups in China with Han, Yi, Naxi and Tibetan among those we met. We flew to Lijiang - the capital of the Naxi Kingdom where women are the man of the house while the men are responsible only for intellectual endeavours (imagine that) - a beautiful town set in a valley with huge snow capped mountains as a backdrop, and Unesco World Heritage site. Lijiang's Old Town where we stayed is a labyrinth of cobbled alleys lined with wooden houses, cafes, shops and art galeries of traditional craftsmen. Irrigation channels line every street with little wood or stone bridges everywhere adding to the charm of the town. After a wonderful few days in Lijiang, we took off for a 2 day hike in Tiger Leaping Gorge. The trek goes through one of China's deepest gorges, supposedly named after a tiger escaped hunters by leaping at its narrowest point . With peaks on either side reaching an average of 13,000ft (4000m) the gorge is very impressive and the 26km trek very exciting. We stayed the night in a mountain lodge called Old TeaHorse Guesthouse and continued on the next day toward Zhongdian, also known as "Shangri-La". This town, located at about 10,000ft in altitude is as close as you are going to get to Tibet, while not actually crossing the border. It was immortalized in James Hilton's novel "Lost Horizon". It has the largest Tibetan Monastery in the SouthWest: Ganden Sumtseling Gompa which is home to over 600 monks. It was built 400 years ago by the 5th Dalai Lama. The scenery was breathtaking and the cold temperatures (2C in the morning) awesome. The food was excellent and our hotel was absolutely beautiful. The kids had a blast just running around the grounds. In May, I joined 15 other ladies and traveled to Mongolia for a week. I had always wanted to see but wasn't sure it would be an appropriate family vacation spot. Actually, Mongolia would be great with kids, but only if you flew from one place to the other, the distance and the scope of everything is so vast. Why Mongolia? The very name conjures up visions of nomads, camels, horses, and of course the most famous Mongolian of all: Genghis Khan (or Chinggis Khaan as his name is transcribed in Mongolia). First stop was Ulan Batar, the capital city of Mongolia. With a population of just over one million it is the largest city in the country. We boarded a comfortable bus for a 2-hour drive outside the city to our first Ger Camp experience in a national park. Gers are the Mongolian equivalent of the American Indian teepee—a portable tent that can be put together (and taken down) between thirty and sixty minutes. After checking in, we were treated to a small version of the Mongolian Naadam Festival, which is a huge national sporting and cultural festival held in July every year. The main activities of the festival are archery, horseback riding, and Mongolian wrestling (the style is similar to Japanese Sumo, though the participants are of normal size). After the festival we took part in a special Mongolian meal called “Khorkhog” which is meat (usually mutton) cooked in hot stones and served with potatoes and other vegetables. The following day we toured the Ulan Batar area which included the famous 28-meter monument of Chinggiss Khaan made of stainless steel, a history museum, and the winter palace of the last Mongolian King. From Day 4 through Day 7, we traveled west and south in Toyota Land Cruisers, first traveling to Karakorum the ancient capital of the Mongol empire where Chinggiss Khaan launched his cavalry that eventually conquered half of the European world. We then continued on through the Gobi Desert. Our “highways” were dirt tracks where we viewed some of the most unique terrain in the world with very few sightings of any other human beings. The landscape included scrub, sand dunes, and red cliffs. We passed flocks of sheep, herds of goats and camels, and an occasional sighting of a lone horseman keeping a watchful eye on his livestock. We stopped to visit a local nomadic family and learned more about this particularly harsh way of life. Many of us were surprised to learn that this nomadic way of life, despite urbanization, lives on in Mongolia. We ended our trip with a wonderful, though bitterly cold, trek in a mountain canyon to view a glacier, followed by a local flight back to Ulan Batar in the afternoon from Dalanzadgad. (Our pilot, we found out, was from Connecticut!) That evening we were treated to a lively Mongolian folk show and a farewell dinner of the real “Mongolian BBQ” to complete our whirlwind week. We all felt as if we had traveled back in time to a much simpler, though rugged, way of life. I have renewed respect for hot showers and flushing toilets!